Find misc. equipment to help with your day-to-day material handling and loading needs. Wheel chocks, raisers and trailer jacks may seem like rudimentary equipment, but can be very handy. Don’t get caught empty handed! View our spare parts page here. Extra strong one-piece construction prevents trailer movement during loading. Made of cast aluminum, the proprietary contour holds chock firmly in place. Copperloy wheel chocks prevent dangerous trailer movement during loading operations. Chock snugs under tire contour for maximum holding and prevents accidental movement from fork truck jolts and vehicle brake failure. Reversible calk design assures dependable grip on any ground surface conditions. 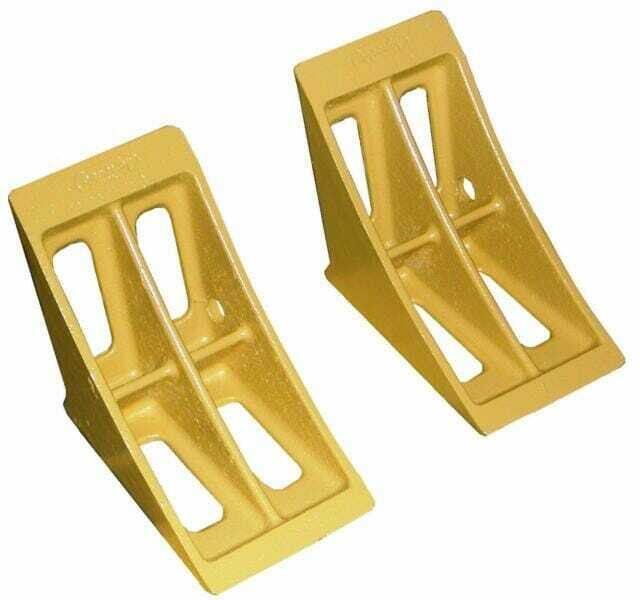 Chocks should be positioned up on hard surfaces or down for ice or soft ground conditions. Tough aluminum alloy one-piece cast construction makes chocks extra strong, extra dependable. Wheel raisers safely and conveniently elevate trucks to dock height. Tough aluminum all welded construction supports up to 24,000 pounds or more with special underbracing to assure complete rigidity. 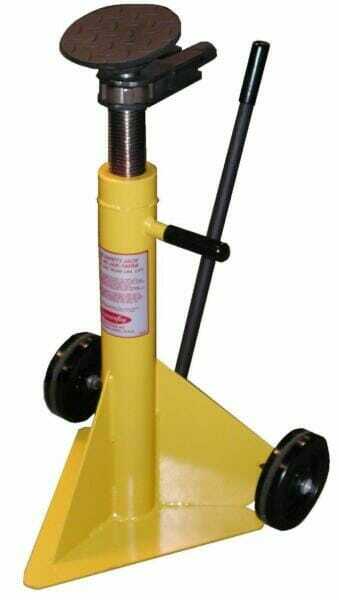 Only one Safety Jack is required to safely support your parked trailer and protect against landing gear failure. It’s one-piece construction meets OSHA standards and is capable of lifting 25 tons and supporting 50 tons. Trailer Safety Jacks are essential for safely loading parked trailers. Adjustable screw jack provides safe, secure support when placed under front of an uncoupled semi-trailer at the loading dock. A single jack under fifth wheel plate can prevent nose heavy trailers from tipping, protect against landing gear failure, and prevent dolly wheel from sinking so that the tractor can’t engage the trailer. Under certain hazardous conditions, a jack at each front corner will prevent the trailer from upending during loading. Learn more about trailer jacks.